‘The Mahabarata endures as the great epic of India. But while Jaya is the story of the Pandavas, told from the perspective of the victors of Kurukshetra; Ajaya is the narrative of “unconquerable” Kauravas, who were decimated to the last man. At the heart of India’s most powerful empire, a revolution is brewing. Bhishma, the noble patriarch of Hastinapura, is struggling to maintain the unity of his empire. On the throne sits Dhritarashtra, the blind Kind, and his foreign-born Queen – Gandhari. In the shadow of the throne stands Kunti, the Dowager-Queen, burning with ambition to see her firstborn become the ruler, acknowledged by all. · Parashurama, the enigmatic Guru of the powerful Southern Confederate, bides his time to take over and impose his will from mountains to ocean. 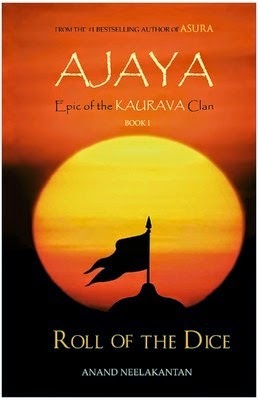 · Ekalavya, a young Nishada, yearns to break free of caste restrictions and become a warrior. · Karna, son of a humble charioteer, travels to the South to study under the foremost Guru of the day and become the greatest archer in the land. · Takshaka, guerrilla leader of the Nagas, foments a revolutionby the downtrodden as he lies in wait in the jungles of India, where survival is the only dharma. · Jara, the beggar and his blind dog Dharma, walk the dusty streets of India, witness to people and events far greater than they, as the Pandavas and the Kauravas confront their searing destinies. Amidst the chaos, Prince Suyodhana, heir of Hastinapura, stands tall, determined to claim his birthright and according to his conscience. He is the maker of his own destiny – or so he believes. Roll of the Dice is the first book in the Ajaya series written by Anand Neelakantan. The author already having tasted success in his earlier counter-perspective novel Asura, featuring Ravana as the protagonist contrary to the ancient Indian novel Ramayan, he does it yet again, with Ajaya, featuring Suyodhana (mocked in the victor’s version as Duryodhana) as the lead character and the whole story is from the perspective of the Kauravas. Note: I’m going to assume that you’ve some knowledge on Mahabharat and hence, I believe I’m not giving any spoilers in the subsequent paragraphs. The prologue starts with Bhishma, the Grand Regent of Hastinapura ransacking the Kingdom of Gandhara and taking Princess Gandhari as the bride for the blind Prince of Hastinapura, Dhritarashtra and ends up committing the blunder of leaving the Princess’ younger brother, Shakuni alive which was going to backfire several years later. The story immediately shifts early days of the Pandava and Kaurava princes, their mischief, their schooling, the rivalry between the cousins, etc. Prince Suyodhana is not satisfied by the way things are run at Hastinapura owing to the misery of the poor, the prevalence of the caste system, suppression of talent among several other reasons and is determined to succeed his father and change the way things are run at Hastinapura. To start with, it was a very courageous attempt from the author; while it isn’t too difficult to write a book featuring Karna despite him having sided with the antagonists in Mahabharat since a lot of people have a very positive opinion on the character and in fact have a lot of sympathy towards him but it does take some courage to feature Duryodhana as the lead character, someone who has only been portrayed as the very personification of all evil deeds and considering that, it was certainly a challenge to make the reader like this character as the protagonist and see things from his perspective but the author goes about the task very well. For starters, he made the character oppose all the systems that most of the members of his target group hate, that is, the caste system, an unquestionable authority, having no value for merit and of course, an education system which doesn’t encourage any freedom of thought. I wouldn’t say that there is anything particularly noteworthy about the plot considering that it isn’t something that needed any deep though; however, I’d appreciate the author for maintaining the crux of the story of Mahabharat despite narrating it from a counter perspective. One more thing I liked about this book, purely from a personal angle was the portrayal of Krishna, whose actions, I totally don’t approve of, at all, in the original work and at times wonder how despite such actions of treachery, deceit and manipulation, people still see him as someone divine and the author brought out these characteristics of Krishna so explicitly which I so thoroughly enjoyed. The author’s pragmatic view over the whole novel was another thing that was very interesting, the way he saw the so called divinity of the Pandavas, the way he narrated the supernatural incidents of the original text in a perfectly logical way, was certainly very enjoyable to read. It was also good of the author to give a background to the story, as to why he decided to write a story on Duryodhana and substantiating the same with his personal experience in Poruvazhy, in his native state, Kerala. The last I’d say is that, he writes with a lot of flair which is sadly lacking in most of the popular Indian authors of the present day (barring a couple of editing issues which I shall gladly overlook considering that the alternatives are authors like Chetan Bhagat and Amish Tripathi). A significant disappointment of mine in this book was again, the character of Suyodhana. While this point might seem contradictory since a while ago, I had praised his characterisation but, I found his behaviour to be contradictory; like how he backs merit in all other cases barring in his own considering how he himself had acknowledged once that Yudishtira was more capable than he was, however, he was strongly of the opinion that Yudishtira had no legitimate claim to the throne considering he didn’t have the paternal lineage. In a way, he supports merit for everyone else barring him making him an ordinary hypocrite and not the ‘Mr. Perfect’ he tried to be. Moreover, it is also surprising that someone who is so assertive, who could didn’t hesitate challenge the authority of Bhishma or Drona, could so easily be drawn into the devious plot of his uncle Shakuni. Barring this, I found the emphasis on Jara completely destroying the flow of the novel. For starters, Jara wasn’t even a significant character, had absolutely no role in the main plot, sings blindly in praise of Krishna despite his idol having no respect for him and his kind whatsoever. Jara was certainly a digression that could’ve been avoided and also something that could’ve shortened the book by at least forty pages. On the whole, I’d say that this was a very good read and was a real pleasure to go through a book that mirrors your thoughts on something where you hold a view contrary to the view of the majority, in this case, Mahabharat. This is a very good read and could be enjoyed if you’ve a fair idea of Mahabharat (though, it is not a pre requisite, just that if you do, it could be enjoyed more) but if you find this review in any way blasphemous to your long held beliefs, I suggest you to not read the book. Based on the start that the author has given to the story, I’m eagerly awaiting the sequel.